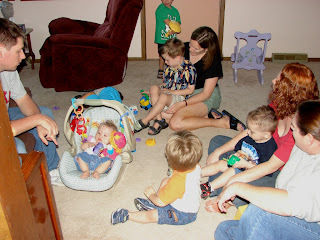 Intentional Family: Retropost: Party for the grandparents! Last weekend was a big one for me. I met a whole bunch of cousins I didn't even know I had. We went to a place called Iowa on Friday night after Pop got off work. Grandpa John, Grandma C, Uncle Ethon, Miss Cheryl, and Uncle Levi were there when we got there. It was nice to see Great-Grandma and Great-Grandpa M, especially since the whole party weekend was all for them. 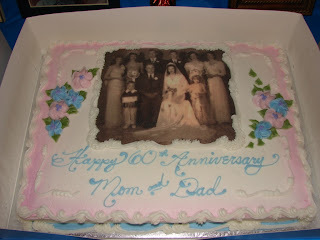 This year they had birthdays when they turned 80 years old and they're getting ready to be married for 60 whole years, too! So Grandpa John and his brothers and sisters threw this big party for all the family to come from all over and have a good time. We took alot of pictures, but here's a few for you to see what kind of things I did while we were there. Friday night when we got there, my Pop and my uncles and Grandpa John got down on the floor with me to say hello. They were kind of poking on my feet and on my tummy and playing with my ears and stuff. I don't know what they were doing really, but they thought it was funny. When Pop and his brothers get together, they always do silly things, and I guess I just got mixed up in the silliness. Saturday Pop and the boys went to play golf after breakfast and the girls stayed at Great-Grandma's house and helped get everything ready for the big party on Sunday. I spent time on a walk with Grandma C and took a nap. Aunt Georgette and Cousin Sarah got there with all the food for the next day, so Mommy and the girls were all in the kitchen working on things and chopping and stuff. 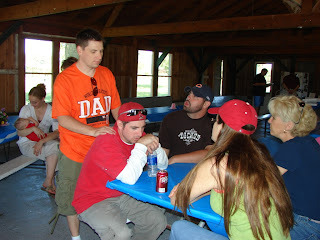 After the boys got back from golf, we went down to Uncle Jerry's house for a cookout, and there were alot of cousins there. Big ones and little ones, but Mommy said they were all cousins. Pop sure has alot of them! They all came to say hello to me when I got there. Isn't that friendly of them? 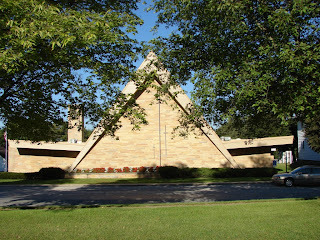 Sunday morning we got up and all went to church with Great-Grandma and Great-Grandpa M at their church. We even got dressed in our special nice clothes for them. 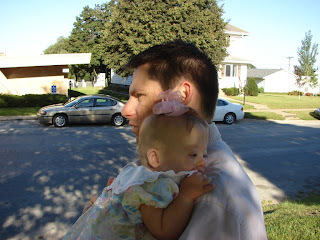 After church, we changed clothes really quick and went to the park to get all ready for the party. We worked some, and then we chatted some while we were waiting for people to come. It was a pretty fun party. There were almost 100 people there, someone said. And that was all family! That's a whole bunch! Lots of people came over to say hello to me that I never met, but they said they like to read my stories on here. Isn't that cool?! So hi everyone!! It was nice to meet all you aunts and uncles and cousins and friends! I met a special friend Valerie that I've heard alot about. Everyone always talks about how great she is, and I can tell you they're right! She's got an extra chromosome just like me, too. She's a cousin somewhere down the line, but I don't know how that stuff works. But her family was super nice, and I got to spend a little time with them, which was fun. Hi Valerie! 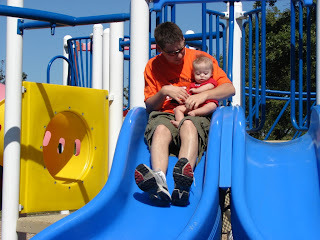 Pop took me out on the playground too, and we went down the slide. I thought it was pretty fun, and it was so nice and breezy out there, too! There was alot of funny stories, and there was a neat video that even had me in it a little bit too! And there was lots of yummy cake. I even got to taste a little. After the party finally got over, a bunch of the cousins went back to the grandparents' house for more games and stuff. Pop was feeding me, and some of the cousins came over to see what was happening. I guess it's fun to watch me get my food or something. Monday morning we all went to brunch, at least the ones of us that were still there. 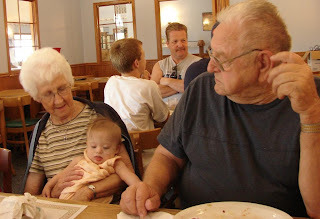 I sat with Great-Grandma and Great-Grandpa for a while. It was a fun weekend, but I was sure tired when it was over. I don't think I remember everyone's names that we met, but it was nice to meet so many people. I think the grandparents had a good time too, and it was all for them! Thanks to Cousin Kathy for letting Mommy and Pop and me stay at your house while you weren't home. That was really nice! 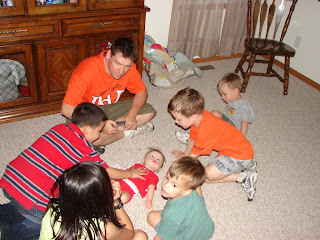 I hope we can have another family party sometime soon....after I get some rest! That looks like a lot of fun!!! You have so many relatives! Great post Nebraska. I wish you were here to do mine. Ugh. Maybe tonight. You were the belle of the ball little miss. Great pictures! it looks like you guys had a great time! That sure sounds like a fun time! What a pretty cake too!